Waukegan East High School "Bulldogs"
Waukegan (population 87,901) is located in far northeastern Illinois in east-central Lake County. The Illinois Routes of 21, 41, 43, 131, 132, and 137 all lead you to and from Waukegan. Lake Michigan serves as the eastern border of Waukegan. The Chicago & Northwestern Railroad and the Elgin, Joliet, & Eastern Railroad both travel through the east side of town. Interstate Highway 94 runs by the west side of town. Waukegan sits just 8 miles south of the Wisconsin / Illinois border. 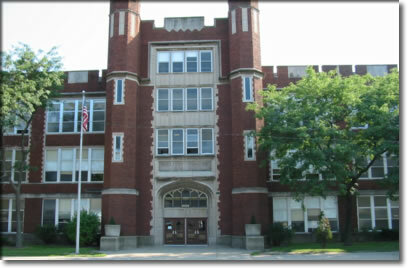 Waukegan High School was renamed Waukegan East High School. The second high school was aptly named Waukegan West High School. Waukegan East High School continued to serve the high school-aged children of Waukegan for the next 15 years. The late 1980's brought about talks of reuniting the two high schools back into one. In 1990 this became a reality. Waukegan East High School was closed. Waukegan West High School resumed being simply called Waukegan High School. Today, only ninth graders attend classes in the Waukegan East building, while 10th, 11th, and 12th graders are located at the Waukegan West building. Though by becoming two separate high schools may have cut the number of potential athletes in half for Waukegan East High, this did not result in a let down of athletic successes at the school. Waukegan East had many great teams and athletes succeed in several different sports. The best of these as found on the IHSA website (www.ihsa.org) are acknowledged below. We are still in need of Waukegan East High School's school fight song. The lady linksters of Waukegan East High School were one of the best golf programs in the state duriung their tenure!! Check out their incredible run in the IHSA Finals for the 15 year period the school was officially open. Two STATE CHAMPIONSHIPS, Eleven TOP-TEN Team Finishes, Five Regional titles, Four District titles, and Three Sectional titles. 1976-77 IHSA State Finals - FOURTH Place!! 1977-78 IHSA State Finals - FOURTH Place!! 1978-79 IHSA State Finals - FIFTH Place!! 1979-80 IHSA State Finals - FIFTH Place!! 1981-82 IHSA State Finals - SECOND Place!! 1982-83 IHSA State Finals - SEVENTH Place!! 1986-87 IHSA State Finals - NINTH Place!! 1987-88 IHSA State Finals - SEVENTH Place!! 1989-90 IHSA State Finals - FIFTH Place!! The boys track team left their mark on the WEHS sports scene as well. A STATE CHAMPIONSHIP and several Individual GOLD MEDALISTS helped the tracksters make a name for Waukegan East High School on the IHSA track & field circuit. David Greathouse Long Jump STATE CHAMPION!! Nate Sloan 200 M Dash STATE CHAMPION!! Relay Team 4x100 M Relay STATE CHAMPIONS!! 1981-82 Team Placed EIGHTH at IHSA State Meet! 1982-83 Team Placed THIRD at IHSA State Meet!! The boys baseball team brought home two Regional Titles in back to back seasons during the mid-1980's. Unfortunately, the team records and coach's names of these and other great baseball teams in WEHS history are not currently available. The boys' basketball team also enjoyed several solid seasons on the hardwood court. Five different teams won Regional Titles, all under the leadership of Coach Larry Lennartz. Four of these titles were in consecutive years during the mid-1980's as well. Two seasons of basetball for the girls lead to Regional Titles as well. Unfortunately, the coach's names and team records of these and other great girls' basketball teams are not currently available. Dave Erdal was the only Waukegan East harrier to earn medalist honors at the IHSA State Cross Country meet. We know the boys competed on the grid iron, however, currently no records are available for the years that Waukegan East High School was technically open. The linksters of East High School had some nice seasons as well. In fact, Dave Ogrin brought home the IHSA Individual Championship in the school's first year of existence, 1975-76! Even today, Ogrin continues playing as a card-carrying member of the Professional Golfers' Association (PGA). The boys soccer program at WEHS had some nice seasons to remember. Including some good records and TWO Regional titles. Four District Championships highlighted the successes of the lady's tennis program at Waukegan East High School. Several lady tracksters earned individual medals at the IHSA State Track Meet. Included in this group is Long Jump State Champion Kim Atwater! Kim Atwater Long Jump STATE CHAMPION!! The WEHS girls volleyball program was highly competitive in the IHSA Tourney. Three District, Three Regional, and One Sectional title helped make the girls volleyball program one of the best in its area. The grapplers earned Three Top-Ten finishes in State Finals Competition. Two District titles, Two Regional titles, and One Sectional title concluded the team successes. Dan Mota led the Indivdiual Medalists with TWO GOLD MEDALS in consecutive seasons. Waukegan East HS's freshmen wrestling coach was Lawrence TenPas. Coach TenPas was once known as State Champion wrestler Larry TenPas of Waukegan High School. As a high school wrestler Larry TenPas won consecutive state championships at the 145 lbs. weight class in 1951 and 1952. His brother, Charles TenPas, took 2nd place at 120 lbs. in 1952 as well. Coach Larry TenPas has a record for pinning all four of his opponents in the State Finals. He is also only 3-Time all American Wrestler from Waukegan! Dan Mota 145 lbs. Wgt. Class STATE CHAMPION!! Dan Mota 155 lbs. Wgt. Class STATE CHAMPION!! Three individuals earned medals in the IHSA's Individual Events Speech Competition. In fact, Neil Flynn and Mike Shklair won GOLD Medals in their respective duet event in 1978!! 1978 Neil Flynn Humor Duet STATE CHAMPION! 1978 Mike Shklair Humor Duet STATE CHAMPION!